While the US market was closed for Martin Luther King day, markets in Europe declined in what can only be described as a panic. Lets throw some scary numbers around: Toronto fell almost 5%, Mexico -5.4%, the MSCI World Index fell 3%, the European Stoxx 600 -5.7%, the FTSE -5.5%, the DAX more than -7%, in Spain IBEX 35 fell 7.5% - the largest single day decline since the founding of the index in 1992! The best advice is to keep one’s head while others are losing theirs. But as with all good advice, it is more easily given than put into practice. But from where I’m standing, things look a bit too emotional in the market. Suddenly here is a lot of talk about the “c” word - which could create a self-fulfilling prophecy if enough people believe it. But I’ve already covered the recent sentiment picture, so no need to repeat myself. To contrast with that raw emotion, consider the cold reality that stocks are actually undervalued (according to the IBES valuation method). Also, the MSCI World Index has a 14 PE ratio (the lowest since 1995). And Europe, even more so with the Stoxx 600 having a PE ratio of 11 (a level it previously held in 2002). But you can’t expect people to be rational. 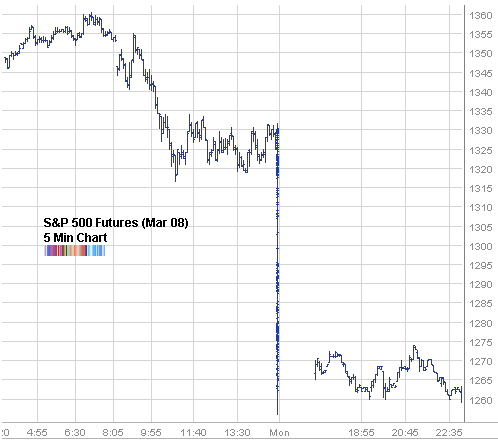 The only catalyst that can potentially turn things around here is either the fabled PPT or a “surprise” Fed rate cut of at least 50 basis points. But the rate cut is at this point not much of a surprise, even though I think the market will take what it can. In the end, we may get neither and the market will have to work its way through every last hopeful trader and investor until there are none left. I’ll be watching the opening range in the market - including the overnight trading since it is heavily traded. That may be a good market tell for the day we are in for.